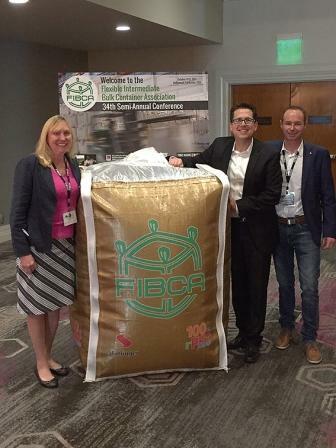 Starlinger, Vienna, Austria – together with its American Starlinger-Sahm US associate company – presented a golden FIBC made from 100% PET bottle flakes at the 34th conference hosted by the Flexible Intermediate Bulk Container Association (FIBCA) which took place in the second week of October in Hollywood, California. The event was attended by more than 100 delegates from more than 25 countries. In recent years Starlinger has devoted considerable resources towards developing its ‘bottle-to-bag’ technology – featured earlier this year on the company’s stand at interpack, Germany – which converts rPET bottle flakes into high-grade fabric. Building on its vast knowledge in the area of PET recycling and refinement, the company initially performed trials using virgin material, followed by use of recycled PET. Starlinger then progressed to producing tapes, and consequently fabric, from PET bottle flakes. The fabric used for the golden FIBC (the gold colour results from the use of plastic beer bottles) is manufactured on a starEX 1600 PF tape extrusion line with twinTAPE precision cross winders and type FX circular weaving looms.